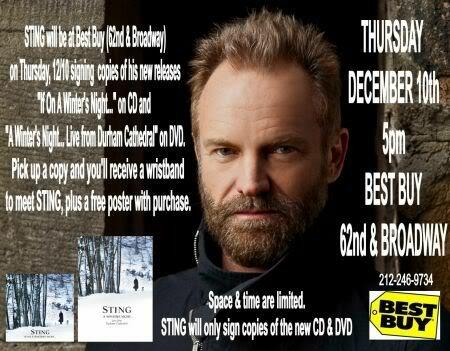 Sting will be at Best Buy in New York (62nd & Broadway) at 5pm on Thursday, 10 December signing copies of his new releases "If On A Winter's Night..." CD and "A Winter's Night... Live from Durham Cathedral" DVD. Pick up a copy and you'll receive a wristband to meet Sting, plus a free poster with purchase! Remember that space and time are limited and that Sting will only be signing copies of the new CD and DVD.